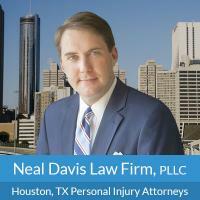 Based in Houston, Texas, personal injury attorney Neal Davis brings two decades of legal experience to the negotiating table and courtroom. If we don't win, you don't pay. "Estamos muy satisfechos con su representacion en el caso de nuestro sobrino. Siempre obtuvimos respuestas a todas nuestras preguntas, y acceso a ustedes sin ningun problema. El caso se resolvio satisfactoriamente y en una forma muy rapida. Gracias!" "Words cant express how grateful i am for having Neil on my side. I was involved in a police sting for online solicitation. When i though my life was over i contacted Neil. He told me he would do everything he could to get me out of my situation. He kept me up to date and answered when i called. In the end my case ended with a no bill and i can finally start living my life again." If you or a loved has been injured, you feel overwhelmed, scared, and confused about what to do next. We're here to help. Neal Davis native Texans attorney, has 20+ years experience trying and winning cases, including cases others thought could never be won. He's been consistently recognized as among the best trial lawyers in Texas. If we don't win, you don't pay. That's our No Fee Guarantee. No Fee Guarantee. You Don't Pay Unless We Win. For 20 years, the Neal Davis Law Firm has worked on all types of legal matters, from criminal to civil. He has formed a personal injury legal team for the limited purpose of civilly representing folks who have been injured. He has tried hundreds of cases to juries, including high-profile cases garnering international attention, and have won under the most difficult circumstances.